A remarkable video captured the action as two kittens swam to a small boat and were rescued from an Alabama river. 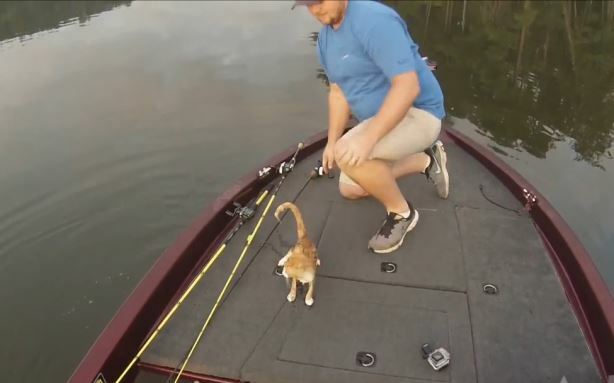 Two young men from Alabama took a boat out on the Warrior River near Bluff Creek Saturday morning to go fishing but made some completely unexpected catches – a pair of kittens they think may have been dumped there. Jason Frost and Brandon Key rescued the kittens and gave them to a family with two little girls who they met on the shore. Frost posted a video on the surprising incident to Facebook and later told the story to AL.com news. Frost and Brandon encountered the first of the two kittens when they heard a splash and saw something swimming toward them. The kitten swam to the boat and Frost picked it up and brought it on board. Kitty shook off the water, meowed and began to rub on Frost’s legs. Brandon saw a second kitten jump into the river and begin swimming directly toward them. When it reached its destination, Frost then brought the second kitten into the boat. The kittens, thought to be a few months old, are extremely friendly orange tabbies who look identical to one another and seemed sure of their footing on board the little boat. “Well there’s a first time for everything, isn’t there?” Frost says on the video. “People were looking at us out on the water like, ‘Oh my God, these people got cats with them,'” Frost told AL.com. The two little girls on shore with their family each wanted a kitten, so they little duo were quickly rehomed. Frost says there are no homes near the spot where the kittens were rescued and he thinks they may have been dumped there. Between noon on Saturday and Sunday afternoon the video at Facebook racked up over 100,000 views, with commenters from all over offering their thanks to the two fishermen for saving the kittens.